Some would say Bitcoin is the future of money while some will simply deny its significance. It wasn’t until the world woke up to losing all their savings in a currency no one even heard of or understood at the time that people started paying attention to the term Bitcoin, or digital currency. But make no mistake; Bitcoin is real money and it’s unlike anything you’ve ever seen or heard of. Before we jump into the discussion, let’s take a peek into the history and emergence of Bitcoin and Bitcoin Cash. In the early 2009, an unknown person or a group of person working under the alias Satoshi Nakamoto developed a mysterious digital payment system, Bitcoin that would allow you to make transactions without worrying about the middlemen – meaning no banks or no central authority. It was the world’s first decentralized digital currency, a cryptocurrency and can be used to buy almost anything online anonymously. As a result, international payments got a whole lot cheaper as bitcoins are not bound to any country or subject to regulation. Soon bitcoins became the second biggest thing to hit the global market after the invention of currency. Bitcoins have come a long way since its inception in 2009. By 2013, the Bitcoin market crossed the billion dollar mark which pushed the cryptocurrency’s ecosystem into a whole new level. What started merely as a digital payment system soon became a global sensation and in the late 2014, bitcoins announced its partnership with the global leader in digital payment platform, PayPal. There were mixed responses regarding Bitcoin’s future following a slow start in the year 2015 and the community suffered a major setback as $5 million worth of bitcoins were reportedly stolen. Plus there have been question regarding how Bitcoin should scale its protocol effectively. As a result, the Bitcoin network released a new cryptocurrency in 2017 called Bitcoin Cash. The new cryptocurrency was created as a result of the Bitcoin fork with almost same goal and to fulfill the original promise of Bitcoin but with a few upgrades. Both Bitcoin and Bitcoin Cash transaction are conducted on blockchains – a digital decentralized pubic ledger used to record transactions across the Bitcoin community. Think of a block as a vehicle which carries transactions from one place to another and once the block reaches its destination, the transaction is completed and chain concludes. Larger the block, more transactions it can hold and eventually faster the processing time. Bitcoin Cash increased the block size from 1 MB to 8 MB and also removed the concept of Segregated Witness. 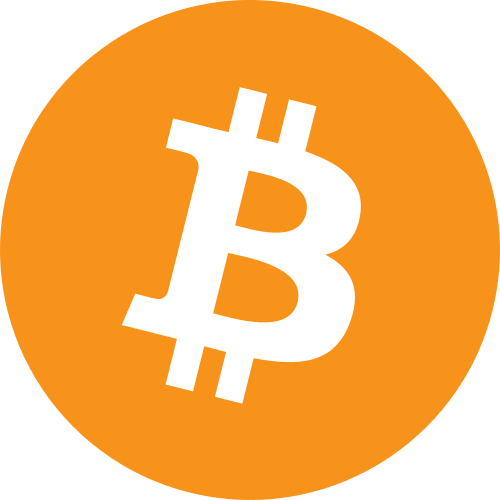 Both Bitcoin and Bitcoin Cash are an electronic peer-to-peer payment system, a cryptocurrency which can be used for performing transactions online anonymously. Bitcoin Cash is a new cryptocurrency emerged as a result of the Bitcoin’s hard fork to avoid the protocol updates that the Segregated Witness brought about. Both are stored in a virtual back account, a digital wallet that allows you to send or receive bitcoins, save money, or pay for merchandise. The main difference between the two is the Max Blocksize Limit. Bitcoin Cash increased the block size which allows more transactions to be processed at a time. The maximum blocksize limit of 1 MB in Bitcoin has caused massive scalability issues which would make more difficult to manipulate the ledgers within the blockchain. While both serve same the purpose – to let the users sell or buy anything online anonymously meaning the transactions cannot be traced back to the users – Bitcoin can only process as much as seven transactions per second which contributes to longer waiting times. Bitcoin Cash solved the problem by increasing the size of blocks from 1 MB to 8 MB so that more transactions can be processed at a time which eventually results in faster payments. Segregated Witness, or SegWit, is a scaling solution protocol designed to improve on the method of handling Bitcoin transactions. The idea of SegWit was presented by the Bitcoin developer Peter Wuille in the late 2015 aimed to change the way information is stored in Blockchain in order to solve the scalability problem of Bitcoin. The idea is to reduce the size of the Bitcoin transaction by removing the signature information from the Blockchain without affecting the transaction ID which allows for greater transaction volumes. Bitcoin Cash, on the other hand, does not support SegWit. Although, Bitcoin Cash is fast emerging as a global peer-to-peer electronic payment system designed specifically to promote faster transaction processing times and lower fees, Bitcoin has a much larger and distributed network and more infrastructure behind it which accounts for better security and stability on the long run. Additionally, Bitcoin is more profitable to mine than Bitcoin Cash. Plus Bitcoin excels in strength of hashing power which accounts for greater network stability. Bitcoin and Bitcoin Cash are two cryptocurrency borne out of the forks from the Bitcoin blockchain meaning anyone holding Bitcoins at the time of fork would now have an equivalent amount of Bitcoin Cash. Both are similar in many ways except with a few technical differences such as mining algorithm. The main difference between the two is the Max Blocksize Limit which is limited to 1 MB in Bitcoin, whereas the block size is increased from 1 MB to 8 MB in Bitcoin Cash which accounts for faster transaction processing times and lower fees. Bitcoin is still the legacy cryptocurrency we’ve known for years and considering its network is widely distributed throughout, the community is growing at an unprecedented rate with no signs of slowing down. Sagar Khillar. "Difference Between Bitcoin and Bitcoin Cash." DifferenceBetween.net. 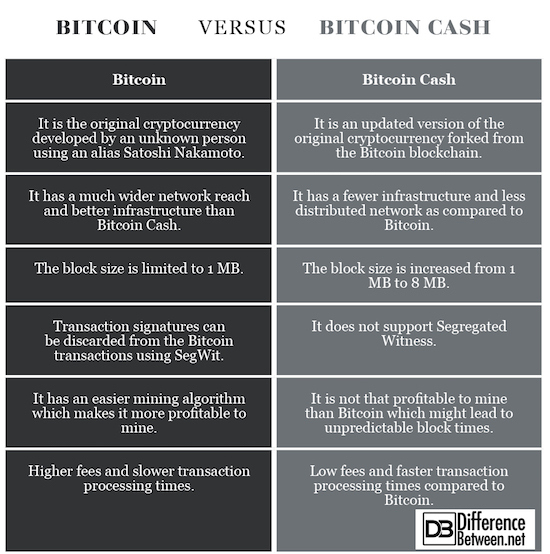 June 5, 2018 < http://www.differencebetween.net/business/difference-between-bitcoin-and-bitcoin-cash/ >. awesome. please publish more cryptocurrency articles. bitcoin, ethereum, blockchain etc.. The World Cup Football 2018 is the most celebrated sporting circumstance of the year. In reality, it’s the most substantial happening of the insensate and buried four years. The eyes of the uncut in seventh nirvana intent be following their teams at the In the seventh skies Cup 2018 Russia, as 32 teams quarrel in the biggest show on Earth. It’s been verbose four years waiting fit the FIFA The infamous public Cup 2018. At near its return comes a plethora of betting opportunities and cool promos.